Thirty years ago, Warren Wilcox brutally murdered his parents and now has just broken out of the Mental Hospital killing everyone in his sight. But, Wilcox is not the only one who the community should be afraid of. An aspiring serial killer decides that Warren is not going to have all the fun himself and quickly starts upping the body count. When Wilcox arrives at his old childhood home, he finds a group of teens who picked the wrong night and wrong place to party. Who will be the last man standing when the two killers finally meet and what is the Wilcox family secret? THE TERROR FACTOR is by no means an Academy Award winning production, but I can’t think of a single slasher film that is. This movie is a lot of fun, however, and is well-done, given the minimal budget it was shot with. The camera-work is very well done and the overall look to the picture is perfect. I especially liked the plot. Although it’s been done A LOT, I still enjoy the-escaped-killer-who-goes-back-home storyline. And this movie is unique because it throws in a SECOND killer, one who is “home-grown”. As the body count rises, so does the fun. The only let-down for me is the acting. I know I shouldn't’t expect A-list talent, but the cast seemed to have a hard time conveying emotion without the use of profanity. Don’t get me wrong: I don’t mind profanity at all. But I don’t think it should be used at the expense of basic acting skills. One a side-note, I don’t think I’ve ever heard the F-bomb dropped so much in a single movie…not even Casino. 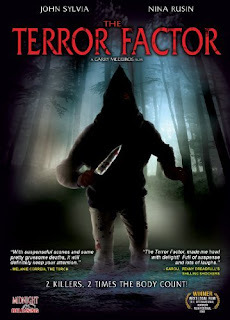 Overall, fans of slasher-flicks should be happy with THE TERROR FACTOR . It’s always fun to see what directors with small budgets can accomplish when they have a passion for their projects. And writer/director Garry Medeiros definitely goes the extra mile on this one. Hayes, my friend, you have done it again. You have a unique talent for finding the most obscure movies known to man. And I love it! Keep 'em coming! I, too, have seen The Terror Factor and I agree: the acting is terrible. I don't know if they use more F-bombs than Casino, but there ARE a lot. Overall, though, I liked the movie pretty much. I especially love some of the death scenes. They got pretty inventive. Have you seen PIRANHA 3D yet? It's time for....A NEW DVD GIVEAWAY!! !